Infrared scan of components such as: main electrical services, main distribution panels, panel boards, load centers, motor control centers, buss ducts, generators, capacitors, transformers, switch gear, safety switches, motor starters, motors and specialty items at the customerâ€™s request. 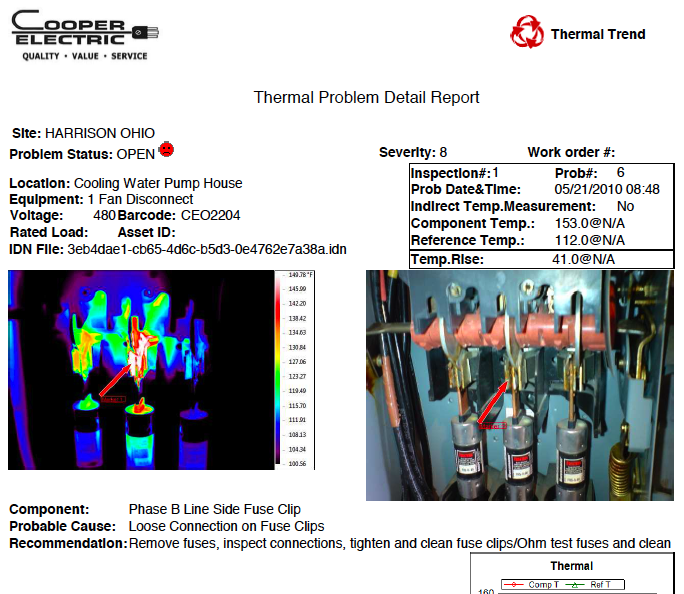 Both an electronic and hard copy report on each component scanned which include thermal image and visual image with temperature measurements and recommended course of action. We use a 640 x 480 high definition resolution pro-series camera. Which produces highly precise temperature measurements and images. Severe or highly critical issues are brought to your attention immediately. Trending information compiled for comparison of scans over time. Where images and measurements are stored for present and future analysis. Bar coding is utilized to indentify components and equipment scanned for trending comparison history.